1. The centre of a building or structure used for overnight accommodation. 2. The centre of a building or structure used as an educational facility, a day nursery or a place of worship. 3. If the construction of a building or structure mentioned in paragraph 1 or 2 has not commenced but an approval under section 41 of the Planning Act or a building permit under section 8 of the Building Code Act, 1992 has been issued in respect of a building or structure mentioned in paragraph 1 or 2, the centre of the proposed building or structure. 2. no approval or building permit mentioned in paragraph 3 has been issued in respect of a building or structure mentioned in paragraph 1 or 2 on the vacant lot. 5. A portion of property that is used as a campsite or campground at which overnight accommodation is provided by or on behalf of a public agency or as part of a commercial operation." CASA Engineering failed to get its Certificate of Approval before the Act was passed, and we have received confirmation from the Ministry of the Environment that they must re-apply under the terms of the new REA. These regulations will make it very difficult for them to locate wind turbines in this area and may discourage them from continuing with the project. We will keep you posted on developments as they occur. The Huron County Federation of Agriculture will be visiting municipalities throughout Huron County asking them to follow Huron East's lead by passing interim control bylaws on commercial wind energy projects within their borders. HCFA directors discussed the current debate around wind turbine developments at their June meeting and passed two resolutions. One was to request lower tier municipalities in Huron to enact a moratorium on commercial wind energy projects pending results of an epidemiological study conducted into the health impacts of the specific infrastructure on residents living near such developments. The other was to support an epidemiological study conducted into the health impacts of the specific infrastructure of wind energy projects on residents living near such developments. HCFA president Wayne Black says he'll be attending council meetings throughout Huron County to talk to councillors about their thoughts about wind projects. He says asking municipalities to enact a moratorium is basically asking for an interim control bylaw, similar to the one Huron East recently passed. "Huron East didn't influence us to pass the resolution but we are asking other municipalities to do the same thing Huron East did," he says. Black, who lives about seven kilometres from the EPCOR wind project in Kingsbridge, says that while he has brushed off arguments against wind turbines in the past as "a lot of NIMBYism and fear mongering," he says recent health problems being experienced by farmers who live near wind turbines have him more concerned. "People who are legitimately complaining live within one kilometre of the turbines. Outside that area, I haven't heard any legitimate complaints," he says. Black says that with members who support and have signed leases for wind turbines and others who would never agree to a wind turbine lease, the HCFA has to be balanced about the issue. He says that while he's been getting emails from Huron East Against Turbines (HEAT), a group of St. Columban residents who have been expressing concerns about two wind projects planned for the St. Columban area, he hasn't had any direct contact with members. 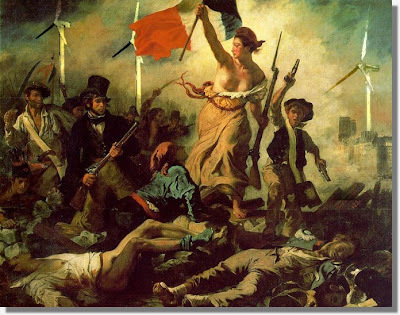 "The St. Columban situation was the straw that broke the camel's back. If there were no wind turbines going up in Huron County, this wouldn't be such a big deal with the Huron federation," he says. "We need better regulations to protect farm families," says Black. He says the farmer who presented the resolution said he didn't want his children asking him in the future why he didn't do something to influence the situation when he had the chance. "It's not today when we'll see the immediate health problems but in 10-15 years when serious problems could crop up," says Black. He adds that from the complaints received by the HFCA, it's farmers who live and work on their farms 24 hours a day who are most effected. "The guys who work off-farm aren't affected as much. The guy who's there 24-7 - it gets to him," he says. In March, the Huron Federation sent a resolution to OFA regarding the study of potential health impacts of turbine developments. “The follow-up review of literature done by OFA, as well as meeting with concerned members in Huron East, along with the request from Bruce Federation, resulted in our board supporting these two current motions” adds Black in a press release about the resolutions. As well, Black says the HFCA is planning to make a submission to the province as Green Energy Act regulations are determined. 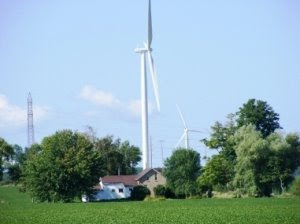 Huron East Council passed a resolution on June 16, 2009, to study land use planning policies and assess the appropriateness of existing wind turbine setbacks in light of the larger setbacks proposed under the Green Energy Act (Bill 150) and enacted an Interim Control By-law. The Interim Control By-law states that no person will be permitted to erect, construct or expand a commercial Wind Energy Facility or a Wind Farm while the by-law is in force. This means that no commercial wind energy developments will be permitted on agricultural lands in Huron East while the study on wind turbine setbacks is on-going. Prior to the passage of the Interim Control By-law, wind turbines were permitted as close as 350 metres from residences, while draft regulations under the Green Energy Act propose setbacks of between 550 metres and 1500 metres depending on the size of the project and sound levels produced by the turbine. A deputation was made before council by Kristi Ross, an environmental lawyer retained by Huron East Against Turbines (HEAT). Ms. Ross set out a number of options which could be pursued by the council, who had already indicated a desire to take the best course of action to serve their constituents. In a surprise move, the council, in a recorded vote, unanimously passed the Interim Control By-law. The council chamber, packed with the supporters of Huron East Against Turbines (HEAT), burst into enthusiastic applause. The scene was repeated when, moments later, a second resolution was also unanimously passed calling on the McGuinty government to do an independent third party study into turbine-related health issues. HEAT has praised the courage of the council in taking these extraordinary steps and hopes that this will serve as a template for other municipalities and citizens’ groups faced with the same problems. Hear from a panel of experts on adverse effects of wind energy projects and testimonials from victims of Ripley and Shelburne/Melancthon wind farms. A group of Southwestern Ontario rural residents is fighting a proposed wind energy project that will be located, almost literally, in their backyards. In this agricultural community, near the village of St. Columban, there will be ten 2MW wind turbines. Each will stand 140 metres tall from ground to tip of turbine blade. Some will be situated a scant 450 metres from residences. Just over 2 years ago in March 2007, flyers appeared in some, but not all, of the residents’ mailboxes advising that studies had begun for a proposed wind project and that the community would be kept informed with “opportunities for public participation”. This past January 14, an article appeared in the local weekly Huron Expositor headlined “Public input wanted for two wind power projects”. The article outlined the projects and quoted Jose Menendez, Special Projects Consultant for CASA Engineering and Construction, that “feedback from the community during the upcoming meeting would be considered in the planning of the projects”. Four months later, with just 4 business days notice, an ad appeared in the Huron Expositor inviting the public to an Open House in nearby Brodhagen, Ontario. The event appears to have been planned to coincide with a time when farmers are busy preparing their fields and planting crops. The 60 or so attendees were greeted by Mr. Menendez and four consultants who guided visitors into a hall containing only a number of tables supporting placards with information about the project. Several vocal residents demanded to know when the “public input” would take place. Mr. Menendez refused to allow a discussion and insisted that questions should be written on a piece of paper, deposited in a box and that they would be responded to in due time. A month later we are still waiting for answers. The dissatisfied residents formed an ad hoc steering committee, dubbed Huron East Against Turbines (HEAT) and staged its own public meeting less than ten days later, packing a local hall with more than 120 concerned residents. The committee, which had assembled an impressive amount of research in that brief time, gave a powerpoint presentation on the drawbacks of wind energy including major health issues due to noise and vibration, inefficiency, environmental degradation, loss of viewscape and a decline in property values. Although invited to speak, the four landowners on whose property the turbines will be located chose not to attend. HEAT announced that it would be joining Wind Concerns Ontario, a province-wide coalition of groups affected by wind energy projects. The enthusiastic crowd backed the organizers unanimously and signed a petition calling on the Huron East municipal council to declare a moratorium on wind projects until a proper epidemiological study could be prepared. On May 19, the council generously listened to and discussed HEAT’s presentation. The 30 minute deputation stretched into 2 hours with over 100 supporters crowding the council chambers. Although the councilors supported the moratorium in principle, they were advised by the Huron County Planning Board that their hands were tied by the recent passage of Ontario’s Bill C 150, the Green Energy Act, which took authority over energy projects out of the control of municipalities. 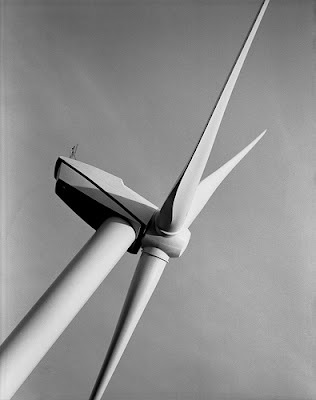 The main issue for the group is the short set-back distances of the turbines. They consider the 450 metres far too inadequate (the World Health Organization and the French Academy of Medicine recommend 1500 – 2000 metres). HEAT has retained a lawyer specializing in environmental and municipal law and is pursuing its fight against the project. It has organized a letter-writing campaign to politicians at every level. Recently an Ontario MPP promised to place a package of our concerns directly into the hands of George Smitherman, Minister of Energy and John Gerretsen, Minister of the Environment. A long-awaited meeting with the riding’s own MPP, Carol Mitchell is scheduled for June 11. In order to educate the greater public about wind energy, HEAT has organized a Public Education Meeting and is advertising county-wide. It is expected that concerned citizens will pack the Seaforth Community Centre to hear presentations by experts on the adverse effects of these projects. Testimonials will be given by victims who were impacted by the electrical complexes at Ripley and Shelburne/Melancthon. The event is planned for Thursday June 18 at 8 pm. Everyone is invited.